To my child, being born at the end of the year has never been a good thing to him. He has to wait, and wait and wait for his birthday...it is an agony for him to watch the rest of his classmates celebrate their birthdays one after another. To reward him for his patience, I wanted to bake a cake that would really make him feel that it is worth the long wait. 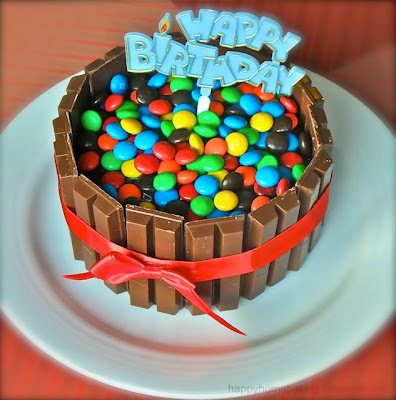 I googled with the key words "cake", "chocolates", "candies"and "birthday". 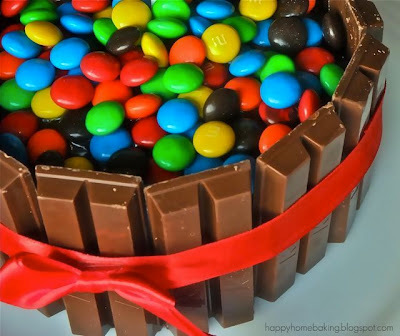 We were blown away by this particular image of a cake that is decorated with lots of M&Ms, and covered with sticks of Kit Kats! I was then left with the task of replicating this Candy Barrel cake. Without any basic baking tools, I could only bake a cake out of a box. A cake mix would be good, but I read the instructions on the box, I would need to use an electric whisk or at least a manual one. I have none of these with me. So I bought a pack of Betty Crockers brownies mix...Supreme Hershey Walnuts Fudge Brownies instead, since all I need is just a spoon. In order to get a more cake like texture, I followed the instruction, to use 3 eggs instead of 2. The end result was not too bad, it was quite close to a dark, dense chocolate cake. This is an excellent cake for someone like me, who can't frost or pipe a cake properly. The candies covered up whatever flaws that I made along the way ^_^"
I baked the brownies in a big pan (it's actually a roasting pan!) and cut out two 5" rounds (yes, it is a very small cake), stacked them on top of one another, sandwiched with a layer of chocolate ganache. I then covered the entire surface with the remaining ganache and 'glued' the kit kat all around the sides. I didn't cover the top with heaps of candies as I think it would be just too much (I used 3 small packs). Instead, I filled up the barrel with lots of wishes for my little one. With a ribbon, a tag (which I brought all the way from home) and a numeric candle (guess how much I got this from Carrefour here?? It costs only one yuan, which is equivalent to S$0.20!!! ), I thought I have made the most awesome looking birthday cake, ever! and, this is so fool-proof! 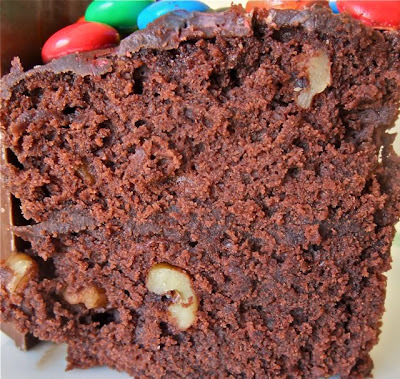 The cake tastes as good as it looks...chocolaty, rich and dense, perfect for any chocolate and candies lovers. 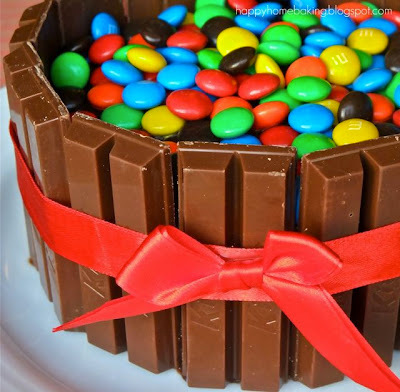 wow, this is totally chocolaty and so full of candy! bright beautiful candies and I'm totally blown away by the look of this cake itself! A taste of heaven.. it does remind me of childhood :) definitely worth the wait. I hope your son thinks the same too! Wow, so cute! Great idea! You should buy n stock up all the different numerical n alphabatical candles since u baked so much, they will definitely be worth it. It cost alot more in Sgp. Maybe can also try looking for all those baking utensils, silicon spatula etc. But i will avoid the edible items. You are a good mum, for sure!! 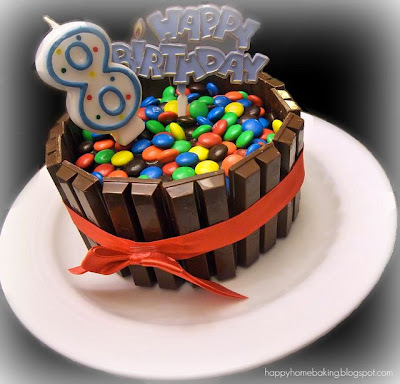 All kids can't resist to this full of chocolate and candies cake. This is really good and beautiful!! Very cute... and a sure treat for the lil one!! wonderful idea! I will KIV this for my hubby, who is a chocolate lover! Thanks for the idea! Wow! 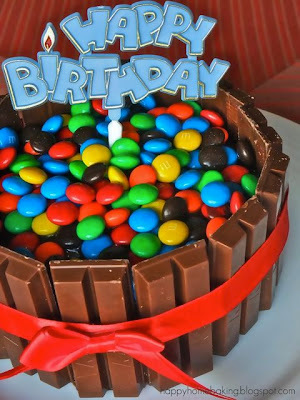 this really looks GREAT for any birthday kid! they will definitely LOVE it! This cake looks awesome! I'll try this for my countdown party this year! The kids will be thrilled. Thanks for sharing! My first thought when I saw the picture of this cake was, "HHB already back in Singapore!!??" I was dead wrong! You still could come up with such gorgeous gateau in a not-that-well-equipped kitchen. Kudos to you! And hey, being December babies ain't a bad thing, too! Mine is considered late ... sort of ... LOL! wow impressive...with limited tools, you already can bake such a perfect cake....amazing. Wow tis looks interesting ur boi muz b delighted! Have a merry merry xmas!! That is one gorgeous cake, HHB! Happy birthday to your little one! I'm sure every kid would want to have a birthday cake like this too. Happy Birthday to your boy! ok, you will be saying you are not creative ... but you are very good in googling for fantastic ideas. I love this and I think if I want to make a foolproof cake, I will adopt this idea. Happy belated Birthday to your little boy. This is a perfect cake for kids. Thanks for sahring the idea. what a sweet mommy, your boys are really lucky to have you as their mom :) Hey I was in Beijing too with my family between 16th and 22nd Dec. It was really cold during the first few days when we arrived from Ping Yao (we went to Xian, Ping Yao then to Beijing. When we visited Summer Palace on 21 Dec, the Kunming Lake was frozen and my 2 kids actually walked and played soccer on the lake ! wow! this cake looks so colourful and yummy yummy! I love chocolates! HHB, that's a great deco idea for a cake! Simple yet very much delightful for a kid. My son would probably love something like this too. I am browsing for my son's 1st bday cake recipe. Saw the nice happy birthday topper. May I know if I can find that in SG? Hi Reira, I got it from Sun Lik at 33 Seah Street. Ur cake looks gorgeous! 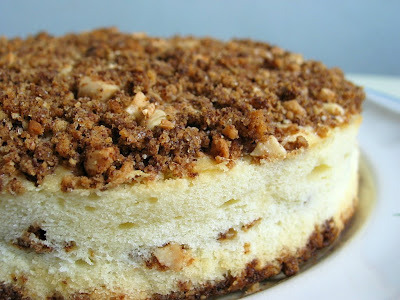 Do you think a tiramisu-based cake can hold the candy? 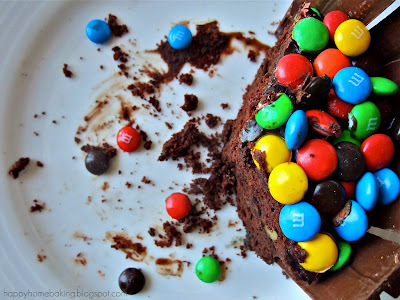 I was thinking of using M&M crispy..
Hi Zai, I suppose a tiramisu cake is able to hold the candies, but unless you don't mind, since the surface of the cake could be quite damp, the M&M's may melt away and stain the cake surface. this cake looks so awesome! !